I've been wanted to try this for a while, I'm so happy you all have gotten it working already. All credit to Rhys. We can't release his report on the web until it's been examined for his degree in a few weeks. After that we'll put it online immediately, of course. If surface mount components are placed bottom up first on a base layer, then a layer of plastics with channels in it added, and then solder extruded in the channels, we could make a whole circuit in one pass! Although, the question is how accurate the resolution is / can be made of the solder deposition approach. Wow. Awesome work guys! Looks like you have to use through-hole components for the electronics? 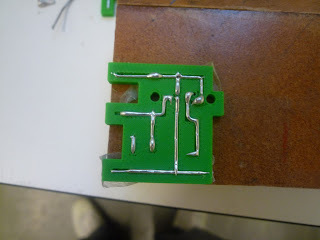 You just make the circuit board with holes for the components, stick the components through, bend the leads or something to keep them in place, and then flip it over and add the solder? Is that somewhat how the process works? I'm getting close to starting my senior year Mechanical Engineering project and I look forward to reading Rhys' paper on this. Again, congrats on the progress! Nice work. It looks like this is a serious step towards printable electronics! >You just make the circuit board with holes for the components, stick the components through, bend the leads or something to keep them in place, and then flip it over and add the solder? That is the next step. 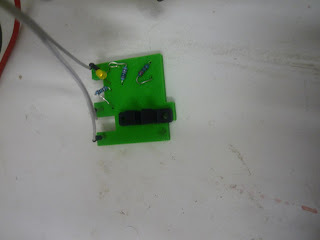 For this test I set the extruder to add the solder into the channels, then once complete used a soldering iron to melt the solder, whilst inserting the components. Having seen the speed of a Reprap soldering I am even more impressed by your achivemen Rhys fantastic.!! Just to clarify that video is running at 3x normal speed. The actual circuit took about 3 minutes. I reckon the extruder in its current form can produce around 100mm of track in a minute. Still its by no means slow. Brilliant work, Rhys! I'm glad to know that you've been able to take up that task. This is lovely work! Is he disappearing after this, or staying on for further degrees? I'm already wondering about putting channels in the component side, and if you can place the components, then extrude the solder on top of the leads. I was watching the actual print clip. A very weird thing happens at about 45 seconds into the clip. 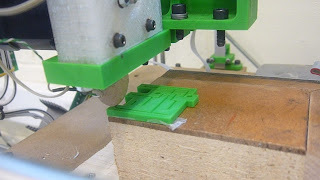 The print object rotates while the print head stays stable. What the hell is happening there? Very well spotted. The fire cement surrounding the tube just came into contact one of the "blobs" in the next channel and nudged the entire board. I intervened and rotated the board so that it would fill the last remaining channel. On a side note I think the issue of the blobs are the biggest problem with the design at present. Firstly because of the problem above, and secondly I don't think it would be possible to have the multilayer boards Forrest mentions without the solder having a consistent (and predictable!!) cross section. I've have a few ideas that may solve the blobs but unfortunately I now have the small matter of a dissertation to write in the next ten days. Also I cannot take all the credit for this work, Adrian and Ed have been extremely supportive and I wouldn't have gotten anywhere near this far without their help. One possible solution to the blob problem might be to make the solder extruder work with a thinner diameter solder wire. Since if I understand it right, the blobs are caused by the extruder heating up the solder, then the heat flowing up the solder wire before the wire melts away and it's the excess solder that causes the bulging/blob effect. A thinner wire wouldn't eliminate the blobs, but it would make the amount of excess solder that comes out to be reduced. And good luck on your paper Rhys. I did my final year research project about 2 years ago (in chem eng though, not mech) and I know that if you're done with the actual work a few weeks ahead of when it's due then you're way ahead of most people. WOW! This is amazing! Congratulations guys! Could you use a low temperature solder paste in a syringe like dispenser on the RepRap to achieve higher accuracy and reduced blobbing? I concur with the previous comments about solder paste. However, one of the main reasons I ended up going for solder was that it is a available in a form that lends itself easily to automation i.e. on a reel, and doesn't have any problems associated with reloading the syringe etc and so I wanted to investigate this first. I agree that the circuit shown isn't going to win any prizes on the quality front, but I'd like to point out that I originally designed this extruder for channels double the size used in the circuit. The quality of these were much better. (Pics are here. Bad news is, the channels were too big to produce the optoswitch circuit, the pins of the H21LOI chip are simply too close together. Yes, I did try this. Just to clarify the previous post, To ensure good heat transfer I wanted to keep the i/d of the orifice and the diameter of the filament to be as close as possible. I made a new extruder with a smaller orifice using 0.5mm diameter solder (current size 1.2mm) and an orifice of about 0.7mm instead of 1.5mm (ish) , the extruder head worked perfectly if the solder was fed by hand. But when using the pinch wheel feed, the solder buckled between the pinch wheel and the entry to the extruder head. It occurs to me that a pinch wheel could be used to fabricate copper wire, if you want to use less solder in your design. Similar to the semi-auto nut threading program, the screen could instruct you to bend right angles in the appropriate direction after the appropriate length has been dispensed, then instruct you to cut, and show an image of the circuit with the appropriate channel highlighted. A slight overhang in a couple places on each channel would allow the wires to snap into place, so they don't shift before the solder arrives. This would mean actual soldering, which isn't as easy to automate because you need thermal contact with the components, but it would solve the problem of solder blobs by simply wicking them away. Ultimately, it would be nice to have a wire bonding head. Unless that's extremely difficult, it may be wortwhile to skip surface-mount entirely and go straight to chip-on-board (or, more precisely, chip-in-bulk). I hate to add a negative tone to the discussion, but are there likely to be any problems from making tracks entirely from solder, what with tin having about ten times the resistivity of copper and also a nasty habit of forming whiskers that cause short-circuits? Maybe we should do what Intel talked about doing a while ago and make 3D circuit boards. The components would be manufactured into the board. this would add stability. Then we would just need a pick and place head or something. I've been thinking along similar lines. Were the channels strictly necessary? It seems that if you blow cool air at the solder it might just hold together. >Were the channels strictly necessary? I must say, I assumed they were needed from the beginning (based on prior student's work with field's metal). However, I started off with channels with a rectangular cross section, and I didn't feel that the track was as secure as it could be. So the tracks are actually shaped like our logo ... a tear drop, tapering at the top so the solder cannot be removed once the channel its filled. There's a kind of solder that's sold for artistic work (such as stained glass and sculpture), which solidifies quickly into blobs. I've used it, and it behaves pretty differently from regular solder. I wonder whether this would enable RepRap to make free-standing solder shapes? A fluid-deposition RP that could make solid metal components... how's that for cool? Also, for some circuit boards, you may be able to draw circuits by drawing solder bridges between a closely-spaced grid of copper pads. They sell through-hole boards in Radio Shack that have copper around each hole. I don't know if the copper is close enough to make reliable solder bridges, but if so, you might be able to use this as a template to keep the lines more consistent (and also use less solder). Hi, Congrats on your success, awesome work. I wish you luck on your defense. Just my $0.02, but would it be possible to use silver solder/brazing material instead (with a higher temperature heater, of course). I would think this might alleviate some of the problems with the limited electrical conductivity of regular solder as the solder wire is made from a mixture of silver and copper with some zinc. I was able to find some small cartidge heaters at McMaster-Carr (http://www.mcmaster.com/#cartridge-heaters/=1nnhq0) that can go up to 1400 degrees Fahrenheit starting at $27.35. They also carry the solder/brazing material (http://www.mcmaster.com/#7761a13/=1nni54). In fact, one of the solders they have is a 56/22/17 mix of silver/copper/Zinc with a melting point of 1145 - 1205 degrees Fahrenheit which might be ideal. I'm sure that both the heater and the solder can, probably, be found for a little less elsewhere as McMaster tends to be a little expensive. My only warning for you, or anyone else that may decide to experiment with this, is that some of the silver solders out there have Cadmium in the mix, which is very poisonous. I recommend looking for an alloy that doesn't have any. Surface tension is what limits the resolution here. Higher resolution would mean more complex circuitry possible with less material (probably needed for this to compete with pretty efficient tranditional techniques). Perhaps the nichrome could even be used to guide the solder and heat it at the same time. Next step, build a transistor. I doubt we actually need ceramic as we could use plastic, we have metal. We need Silicon or Germanium. Sorry if this is a dopey question but why do we need to involve melting? Why not use fine metal power is a sort of plasstic coating so it acts as a wire carrying the signal? There are organic materials that can be deposited from solution and used to build transistors. It seems like it should be possible to ink-jet print a microcontroller on a single letter-size sheet of plastic. But RepRap probably doesn't have the precision to print the large numbers of transistors that are required for digital circuits - at least not efficiently - and analog circuits depend on individual device characteristics. For 3D circuits, if you can't make entirely get rid of the blobs, wouldn't it be possible to build plastic bridges over the traces without actually contacting the trace (I know you can do some degree of overhang), and thus hide the unevenness? >Why not use fine metal power is a sort of plasstic coating so it acts as a wire carrying the signal? I'm not entirely sure on this one to be honest, I did think about it myself some months ago. I think it may work, but there would be alot of problems that need to be solved. Having a really fine powder will mean its very hard to control. Equally at some point were going to have some holes in the board to attach components to the circuit,we could run into problems with the powder escaping. Also, how would you solder to it?? >wouldn't it be possible to build plastic bridges over the traces without actually contacting the trace? Thats the plan, in fact what would it matter if the plastic came in contact with the trace, if anything it would ensure the trace is held securely...I must admit I think a bit of a redesign is required to solve the problems rather than tweaking settings. In short, I think the diameter of the orifice needs reducing. The problem is, we can't machine anything out of brass (brass appears to be slightly soluble in solder - ok for normal use but if your extruding meters of filament the nozzle slowly disappears ), This extruder was based on a stainless steel needle. The problem with that is the filament needs to be a smaller diameter than the needle, I did try reducing the orifice and the filament a bit more but ran into loads of buckling problems....I'm hoping to come back to this at some point once we have a head changer. If the plastic was laid down touching the trace, and there was a bump in the trace, then there'd be a bump in the next level of plastic. If you build a bridge, you won't get any unexpected bumps. Doesn't teflon stand up to molten solder? Could you use a teflon-lined brass orifice? >then there'd be a bump in the next level of plastic. If you build a bridge, you won't get any unexpected bumps. >Doesn't teflon stand up to molten solder? Could you use a teflon-lined brass orifice? Very impressive! I'm curious, have you been able to print any more complex circuits since (specific functions and schematics)? Also, where can I find the design for this modified circuit-printing RepRap? why not reflow soldering ? 1 - one with a laser head capable of vaporising copper. then use the number 1 to "etch" the virgin copper board with your circuit design. the plate goes back to the machine number one, that uses the laser (at a lower power) to melt all solder on the board. A laser head capable of vaporizing copper is far from trivial. The Epilog laser etchers can't do it. You'd probably do better putting a Dremel-like tool on the head and physically cutting the traces. There are PCB-prototyping machines that do this. Or just deposit a mask on the copper (either a Sharpie or melted plastic, if it'll stick well enough) and chemical etch the copper. Where can we read Rhys' report paper? I'd love to see further development on this. Hi, I was able to print 14 feet of solder using a system similar to the Fab@Home. The biggest problem with making a board will be passing current through the solder. I was using the printed wire for an electromagnet and the current had a tendency to melt the solder. Circuit board might not have that issue. Try adding one more piece, a piece to deposit a copper wire. Anchor points for the wire could be solder or plastic. Connections would be in solder. Do you think you can pull it off? Hey, people, i have an brilliant idea about sircut printing. Look - ABS have soldering T about 240C, and POS-61 - about 190. This mean, that we can have liquid metall in plastic container. Then, for decreasing electrical resistance, we can use not a whole solder, but a composition of fine cuprum dust in soldering matrix. And with components - this is simplest problem. Is need to have a holes, with height equal to height of component, with pin separators. And after component installation - simple add an solder in 'filling' mode. After this, we add another plastic layer, and can place a next circut and next component level above installed.